3D MP3 Sound Recorder G2 allows you to reduce some noise from your recording in real time. A noise gate ,blocks signals whose amplitude lies below a certain threshold, and lets other signals through. It usually has controls for attack time and release time. The attack time is the time during which a signal is fades in from the gated state. 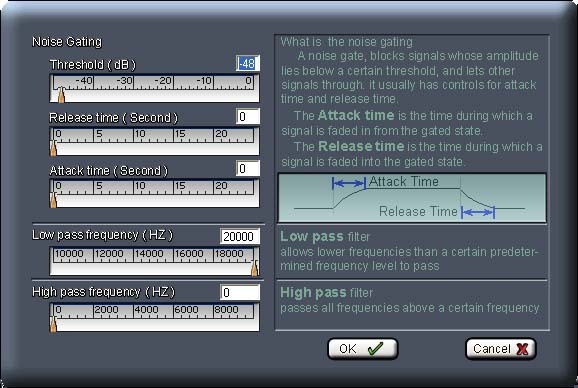 The release time is the time during which a signal is faded into the gated state. Pass all frequencies above a certain frequency (0 to 10000 HZ ). Enable these options from front panel, the effect will be added to the recording.